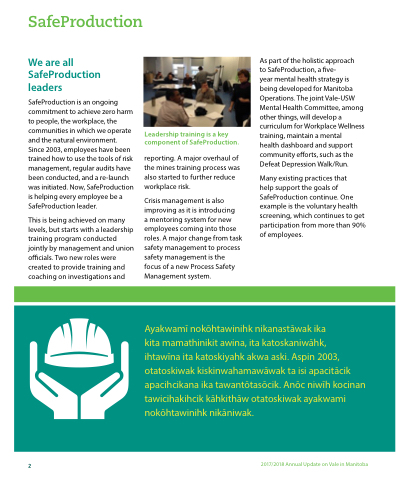 SafeProduction is an ongoing commitment to achieve zero harm to people, the workplace, the communities in which we operate and the natural environment. Since 2003, employees have been trained how to use the tools of risk management, regular audits have been conducted, and a re-launch was initiated. Now, SafeProduction is helping every employee be a SafeProduction leader. Leadership training is a key component of SafeProduction. reporting. A major overhaul of the mines training process was also started to further reduce workplace risk. a mentoring system for new employees coming into those roles. A major change from task safety management to process safety management is the focus of a new Process Safety Management system. health dashboard and support community efforts, such as the Defeat Depression Walk/Run. help support the goals of SafeProduction continue. One example is the voluntary health screening, which continues to get participation from more than 90% of employees. ihtawīna ita katoskiyahk akwa aski. Aspin 2003, otatoskiwak kiskinwahamawāwak ta isi apacitācik apacihcikana ika tawantōtasōcik. Anōc niwīh kocinan tawicihakihcik kāhkithāw otatoskiwak ayakwami nokōhtawinihk nikāniwak.